I was recently contacted by Sunwarrior Vegan Protein Powder Supplements and sent a sampler pack for the purposes of review. 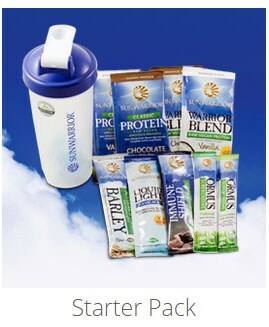 Now, I must admit – I already use (and am a huge fan of) the Sunwarrior Warrior Blend Vanilla Protein Powder. So I was really excited about trying out some of the other products offered in their line. Plus, a handy shaker bottle! 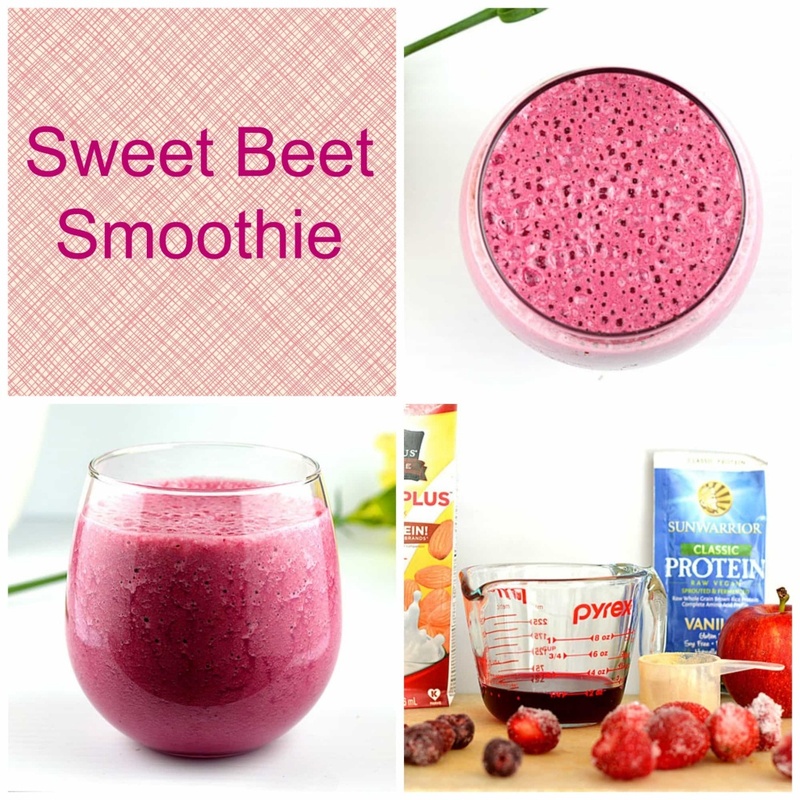 The first recipe I created was for this Sweet Beet Smoothie using the Sunwarrior Classic Protein Vanilla Powder. I really loved the combination of almond milk and protein powder. It’s not overly sweet but you can always add a bit of agave if you prefer it sweeter. The classic protein powder performed very well in this recipe. I was really pleased with how it turned out! 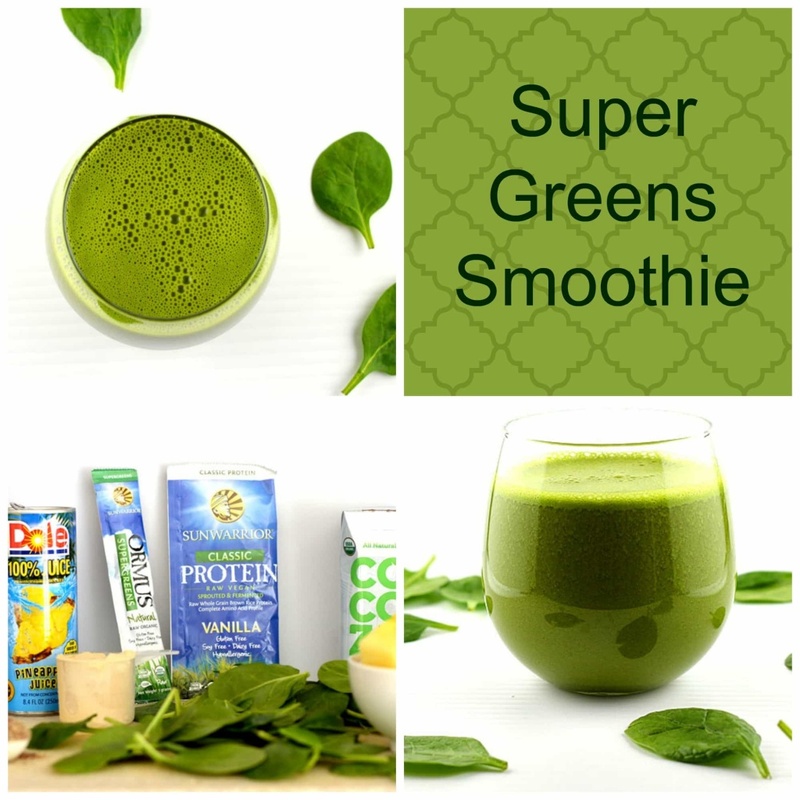 Green smoothies are all the rage right now and I went all out with this Super Greens Smoothie! I used Sunwarrior’s Classic Protein Vanilla Powder for this one as well. I also added their Ormus Greens Natural and at the last minute, decided to add the Activated Sprouted Barley. This recipe has it all … spinach leaves, pineapple chunks, coconut water and ground flax meal. Probably the healthiest smoothie I’ve ever made. And it was surprisingly delicious. I combined the liquids and the powders, along with the flax for about 5 minutes prior to blending. I prefer this method to ensure everything blends together really well. 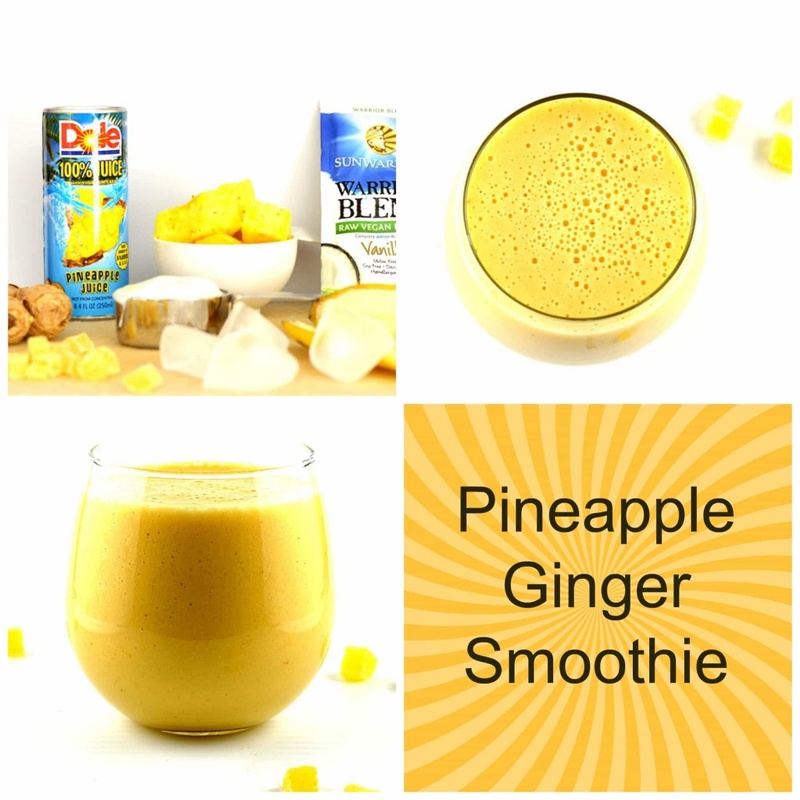 Next up, and probably my favorite of the three smoothies, was this Pineapple Ginger Smoothie. I used Sunwarrior’s Warrior Blend Vanilla Powder for this recipe. Sweet fresh pineapple chunks, banana, vegan almond milk yogurt (I used vanilla), freshly grated ginger root, pineapple juice and ice round up the ingredients list. This was sweet and absolutely delicious. Definitely one I’ll make again and again. As I mentioned above, I already personally use the Sunwarrior Warrior Blend Vanilla Powder and just love the flavor it added to this smoothie. Thumbs up on this one! After three smoothies, I was really ready for something a bit different. And I think I saved the best for last! 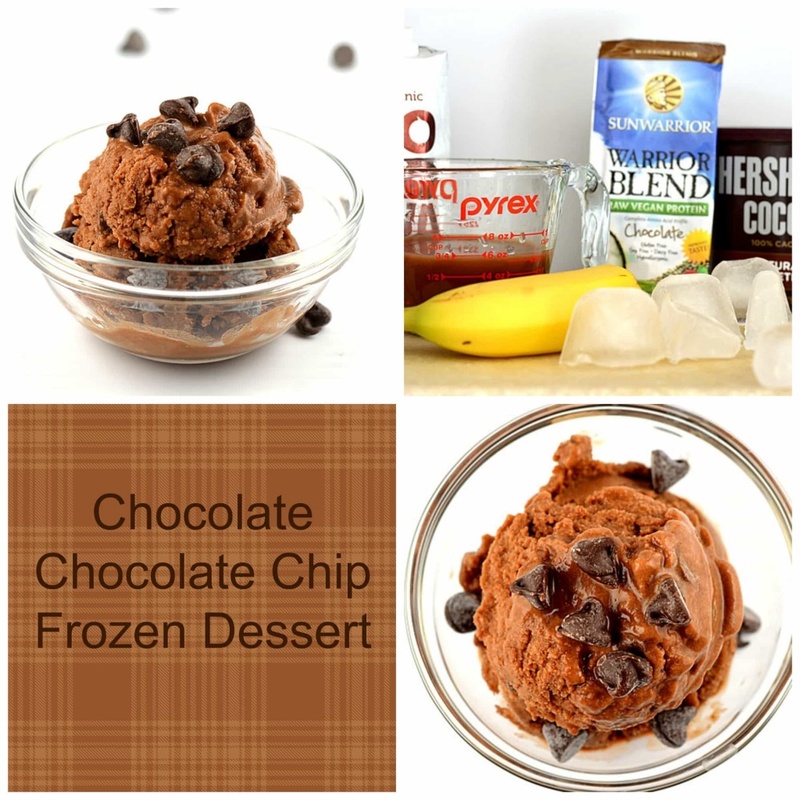 I am a huge chocolate fanatic and I decided to use my often neglected ice cream maker to create this Chocolate Chocolate Chip Frozen Dessert. I used Sunwarrior’s Warrior Blend in Chocolate for this one along with chocolate coconut water (which already contains some sweeteners), cocoa powder, a banana and ice. I prepared it like I would a smoothie and then transfer to the ice cream maker. I let it go for about 2o minutes until it was soft-serve consistency. At that point, I added vegan chocolate chips and gave it another 10 minutes. I froze this mixture for about 30 minutes to an hour and then scooped. Sooooo good! While I didn’t get to incorporate everything sent to me, I will certainly continue creating with them and post recipes for you. Sunwarrior has quickly become a front runner for me in the world of vegan protein powders and supplements. If you would like to try Sunwarrior products for yourself, you can visit their website at: www.Sunwarrior.com I love that you can now get some of the products in single serving sizes which is really convenient!